The 7MSN Ranch: What do jackrabbits and jackasses have in common? What do jackrabbits and jackasses have in common? That sounds like the beginning of a joke. I wish I had a punch line. What I do have, finally, are a few pictures. For as many jackrabbits that populate the desert southwest, you'd think I would have captured a few in my camera before now. It's not like they're hard to find. They can get to be the size of Volkswagens. If I'm not wearing my glasses, I can't tell the difference between a jackrabbit and a coyote because they're the same darned color and size. They're also very shy and very fast. I was driving around in the Ranger on Sunday fixing fence, when I surprised this guy. Me: Don't be afraid. I won't hurt you. Me: It's just that I've got this thing for lovely long ears. I've never seen one up close before. What beautiful ears and eyes he/she has! Congrats on the jackrabbit shots! That critter is WAY different than the little cottontails we have here in the east. Look at the veins in those ears! Great shot, Linda! He's HUGE! Thanks for sharing! OMG! 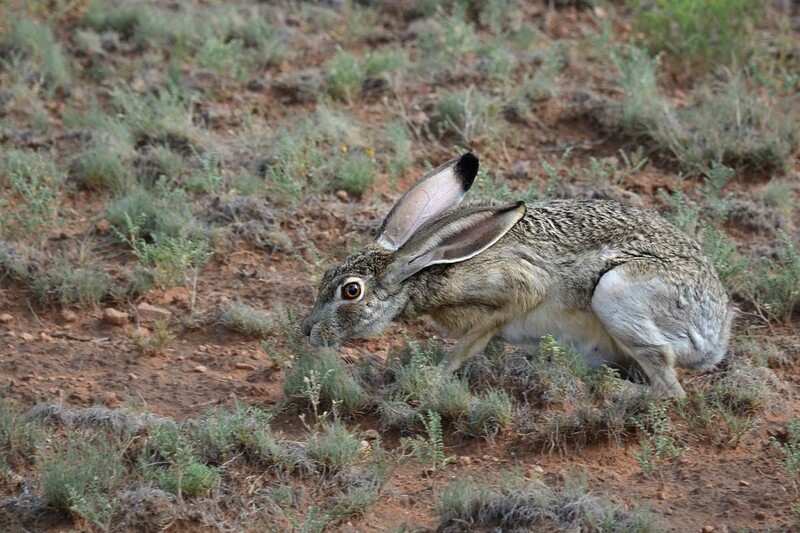 I've never seen such a beautiful photo of a jackrabbit. I own rabbits and love them, but if this guy lived with me I'd never get anything done. Will you put him with For You? You are right about how BIG they are! I used to scare some out of bushes when I was taking my morning walks (not today...it's already 90 degrees by 5:00 a.m.). They always scared me! They were HUGE!!!! Bow Street - I'd be happy to make one of these downloadable. Which do you prefer? Big air conditioners on his head. Ours don't get quite as big as a VW, but it sure is something to see one run. I love big ears too! :) He is huge-I bet he is really soft! Maybe you could put a saddle on him? Great photos!! Love the black tips on those huge ears! very interesting..... I always thought that jackrabbit was just another name for the regular ole bunny; but these are very different looking than the standard bunny we get around here! 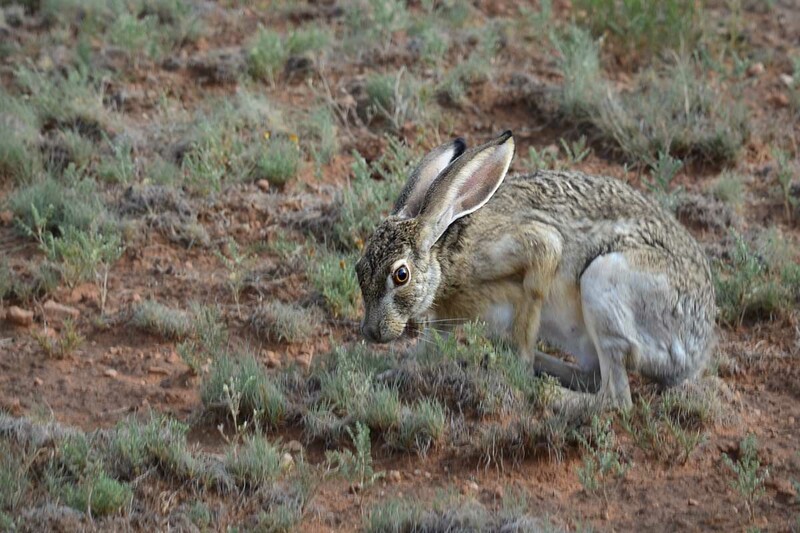 she almost looks intimidating in that second picture: a jackrabbit stink-eye! But yes, she has lovely long ears! Beautiful shot as always!! Beautiful! But they do munch your landscaping much higher than the cottontails. Are they really that big? As big as Smooch? You're teasing, right? Maybe that's what got her hackles up the other day. So nice of him to put his ears up for you. Very special pictures. Looks like food is scarce in them there hills. He really does blend in to the ground cover. Such an array of animals at your place. Nice pic. Neat! Love the black tips and details captured on the ears. 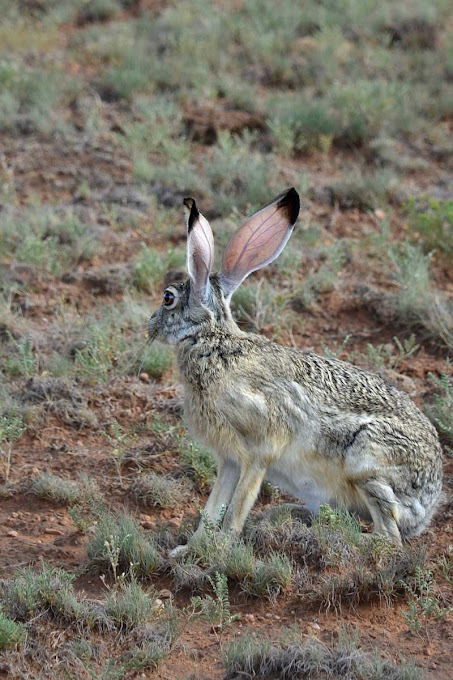 Gosh these are gorgeous shots of a jackrabbit. And you're right, not often seen. They always remind me of "Watership Down"....the stinkeye especially. I've been thumped by a regular bunnykins rabbit taking it from the hutch....I would hate to think what those back leg whoppers would do to a person, animal, thing. Ouch. So cool. I've never seen one. thank you, Carson. Hard to choose! but I don't think anyone has ever captured those ears quite like photo number THREE. Great photos! I found that if you whistle to a rabbit it'll sit and listen for a while. Not a loud "Taxi!!!!" whistle but a melody of some kind, loud enough for the rabbit to hear. Rather cool on the whole. thanks for my first ever sighting of a jack rabbit, of course dumb bunny hubby said when i showed him your stunning pic, i wonder if you can eat jackrabbits. yes, i am shooting him now. Mmm, great for taking blood samples, those ear veins. - I bet there are (next to) no other photos of jackrabbits on the Internet that show this beautifully how translucent the ears are. That thing doesn't look real. Oh my gawd, Linda! Those are fantastic shots! He has such big eyes, he reminds of the little fellow chasing the acorn in the cartoon Ice Age. His ears look like flower petals. So lovely!